Blessed is God, Who has shown mercy upon us, Who has provided nourishment for us from the days of our youth. As You provided sustenance for every living creature, Lord, fill our hearts also with joy and gladness. Thus, enjoying always a sufficiency in all things, we may all the more excel in every possible virtue and good work, and give proper glory, honor and worship to You, through Christ Jesus our Lord and in the Holy Spirit, unto the ages of ages. Amen. We thank You, O Christ Our God for You have filled us with Your earthly gifts. Do not deprive us though of Your Eternal Kingdom, but, as You came into the midst of Your Disciples, O Savior, come and be also with us and save us. Amen. "Affliction, if not accompanied by patience, produces torment, for a man's patience casts off his distress, while faintness of heart is the mother of anguish. Patience is the mother of consolation and is a certain strength which is usually born of largeness of heart. It is hard for a man to find this strength in his tribulations without a gift from God, received through his ardent pursuit and the outpouring of his tears." On February 6th Our Holy Orthodox Christian Church commemorates, honors, and entreats the holy intercessions of the following Saints, Forefathers, Fathers, Patriarchs, Prophets, Apostles, Preachers, Evangelists, Martyrs, Confessors, Ascetics, Teachers and every righteous spirit made perfect in faith: Saint Photios the Great, Patriarch of Constantinople; Saint Bucolus, Bishop Smyrna; Saint Barsanuphius the Great and Saint John the Prophet; Saint Dorothea of Caesarea in Cappadocia; Saint Iakovos of Kyros; Saint Julian of Emesa; Saints Fausta, Evilasius, and Maximos at Cyrzicus; Saint Dorethea of Kashin; Saints Christina, Callista, and Theophilos of Caesarea; Saint John of Thebes; Saint Arsenius of Iqalto, Gerogia. +By the holy intercessions of Your Saints, Holy Martyrs, Holy Fathers, Holy Bishops, Holy Ascetics, Holy Mothers, Holy Patriarchs, O Christ Our God, have mercy on us and save us. Amen. Our Holy Father Photios the Great was born into one of the great families of Constantinople in 810 A.D. His father, the Spatharios Sergios, was the brother of the Holy Patriarch Tarasios (+Feb. 25th) and his mother Irene's brother had married the sister of the Empress Theodora. His parents loved the monks and were martyred during the iconoclast persecution, bequeathing their son a more precious legacy than wealth and high rank, namely, love of the True Faith unto death. He received the best possible education in every branch of learning, both sacred and secular. He spent whole nights in study and, possessing exceptional intellectual ability, there was no field of contemporary knowledge in which he did not become proficient. In breadth and depth of learning, he was the greatest scholar of his time and a central figure in the intellectual renaissance of Byzantium after the turmoil of iconoclasm. He occupied a professional chair at the Imperial School established in the Magnaura Palace, where he taught the philosophy of Aristotle and theology. In the course of an embassy to the Caliph at Baghdad, he composed from memory, for the benefit of his brother, a critical summary of around 280 books of all kinds-his Myriovivlos (Library), a proof of the extent of his knowledge. On his return from Baghdad with his mission accomplished, he was appointed chief secretary to the imperial chancellery (protasecretis), but he still had time for his academic duties and for his beloved studies. In 857 A.D. Bardas, the uncle of Emperor Michael III, assumed power with the title of Caesar. He forced the resignation of the Holy Patriarch Ignatios (+ October 23rd), who had denounced his immoral behavior, and prevailed on the clergy to elect the wise and pious Photios as his successor. Saint Photios held out against his election as strongly as he could, since he regarded death itself as preferable to that perilous office in those troubled times; but, in the face of injunctions and threats he at last gave way, and agreed to give up the peace of his study and philosophical discussions with like-minded friends. He was consecrated Patriarch of Constantinople on 25 December 858 A.D., having been raised through all the degrees of the Priesthood in the previous six days. In a letter to Caesar Bardas, he wrote: "Our promotion has not been willed by us and we are enthroned as a prisoner..." The more extreme supporters of Saint Ignatios then used every means to oppose and discredit the new hierarch, alleging the irregularity of his sudden elevation from layman to Patriarch. Saint Photios sought to avoid confrontation and did all in his power to re-establish unity and peace in the Church by strengthening Her in love, the "bond of perfection." He took firm action against the remaining Manichean and Iconoclast heretics, and took in hand the restoration of the many churches, monasteries and charitable foundations damaged by the Iconoclasts, and took, a special interest in missions to spread the Gospel among the barbarians. But his attempts to appease the supporters of Ignatios failed; and, while expressing disapproval of the violent measures taken against them by the government, he was obliged to summon a Council in 859 A.D., which confirmed the deposition of Ignatios and exiled him to Mytilene and then to Terebinthus. Agitation against St. Photios continued however and, in 861 A.D. another Council, known as the "First-Second", assembled in the Church of the Holy Apostles with the official purpose of approving the restoration of Orthodoxy and of pronouncing the definitive condemnation of iconoclasm. In addition, the Council recognized the validity of the nomination of St. Photios, with the full agreementof the Papal legates present there, who, although acting contrary to the Pope's instructions, thought that they had thus achieved the triumph of Papal authority. In other words the Papal legates hoped that by recognizing Photios as Patriarch he would be subordinated to the authority of the Pope of Rome. When the new Patriarch proved unsubmissive, Pope Nicholas I anathematized Photios at a Roman Council. The arrogant and ambitious Pope Nicholas 1st (858-868 A.D.), who supported Ignatios, took the opportunity of the controversy to assert openly for the first time the pretension of the Popes of Rome to jurisdiction "over the whole earth and over the universal Church." To the primacy of honor of the Roman Church and her authority as arbiter in matters of dogma, which had always been acknowledged by the other Churches-especially when the Arian, Monothelite and Iconaclast heresies were being promoted by Emperors in Constantinople-the Papacy now ascribed to itself the hegemonic claims which the Frankish empire, after the death of Charlemagne and the Treaty of Verdun (843 A.D.), could no longer sustain. On the initiative of authoritarian Popes, the Papacy sought to exercise a supremacy over the whole Church that was supposed to have been granted by Christ Himself and to have given the Popes the right to intervene in the domestic affairs of other Churches, i.e., Constantinople, Alexandria, Antioch, Jerusalem, and to impose on them all the usages of the Roman Church, such as clerical celibacy, Saturday fasting and unleavened bread for the Holy Eucharist. The opposition of Pope Nicholas I and his interference in the internal affairs of the Byzantine Church, when he had only been requested to pronounce decisively on Iconoclasm, drove Saint Photios to condemn the novel usages of the Roman Church. "Abolition of small things which have been received through tradition", he wrote, "will lead to complete contempt for the dogmas." Incensed by this response, the Pope wrote to all the bishops of the East accusing Photios of adultery as being in illicit possession of another's See, and he decreed on his own initiative the deposition of the Patriarch of Constantinople-a thing never before heard of. Moreover, asserting the right of Popes to judge Councils, he declared that the decisions of the "First-Second" were invalid. Nor did he stop there, but summoned to Rome a Council of Western bishops, which declared Saint Photios deposed and excommunicated all the clergy ordained by him. When Emperor Michael II objected to these proceedings, the Pope informed him (in 865 A.D.) that he derived his supremacy over the Universal Church from Christ Himself. Then, in successive letters, he subjected Saint Photios to a litany of insults, to which that true disciple of the Savior made no reply. The Holy Patriarch did not allow these conflicts and cares to hamper his Apostolic activity. 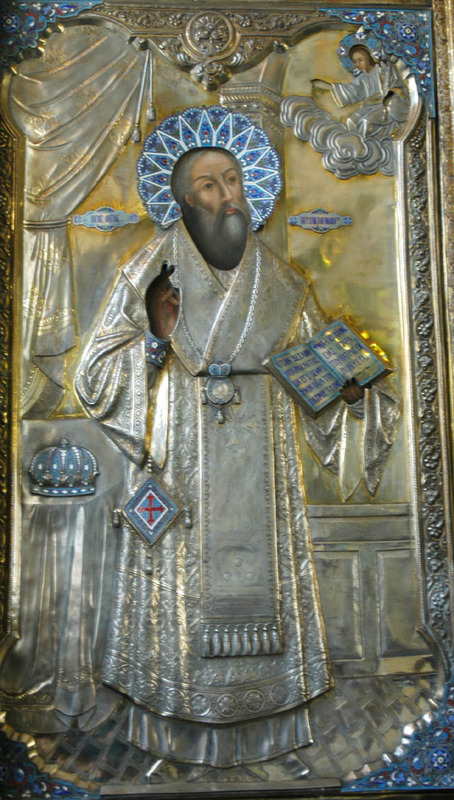 With the support of the Emperor, he promoted the evangelization of the Slav peoples, engaging his learned friend and colleague Constantine (whom we venerate as Saint Cyril) and his brother Methodios, an ascetic from Mount Olympus, to undertake a preliminary mission to the Khazars of Southern Russia in 860 A.D. Three years later, as the request of the Prince of Moravia, he sent the two brothers on that great missionary endeavor which marked the beginning of the conversion of the Slav peoples of the Balkans. Saint Photios addressed an Encyclical Letter to all the bishops of the East in which he vigorously condemned the errors of the Latins, especially the Filioque (i.e., an addition by the Latins to the Creed which states that the Holy Spirit proceeds "From the Father and the Son" which is contrary both to the decisions of the Ecumenical Councils of the Church and the Holy Scriptures that state that "the Holy Spirit proceeds from the Father".) He summoned a Great Council to Constantinople, which in 867 A.D. proclaimed the victory of Orthodox doctrine over all the heresies, and anathematized Pope Nicholas and his missionaries in Bulgaria. The two Churches were thus separated by a formal schism, which was a precursor of the final break in 1054 A.D. When Leo VI (886-912 A.D.) succeeded his father Basil I, he summarily deposed the Holy Patriarch, holding him indirectly responsible for making known to his father a plot which Leo had hatched against him. Saint Photios was imprisoned as an evildoer in the Monastery of the Armenians and was confined there for five years, lacking all human consolation but shining like gold tried in the furnace of manifold temptations (1 Peter 6-7). This was the period which, without books of his own, he wrote the mystagogy of the Holy Spirit-a systematic refutation of the Filique heresy, in which he shows that the Holy Spirit proceeds eternally from the person of the Father, the "source of the Divinity" and is sent to us by the Son in order to make us "partakers of the Divine Nature" (2 Peter 1:4). Leaving this treatise as his testament to the Holy Church in view of conflicts to come, he departed to join the choir of Holy Fathers on 6th February 893 A.D. The miracles which soon took place in plenty at his tomb helped to convert even his inveterate enemies. Humble, serene and long-suffering in tribulations, this true Confessor of the Faith, unjustly called a fanatic by his enemies, remains one of the great luminaries of Orthodoxy and a wholly trustworthy witness to the spirit of the Gospel. As a teacher to the world, being one with the Apostles, intercede with the Lord of all, O Photios, that He may grant the world peace, and to our souls His great mercy. Far-reaching beacon of the Church and God, inspired Guide of the Orthodox, you are now crowned with the flowers of song. You are the divine words of the Spirit's harp, the strong adversary of heresy and to whom we cry, "Hail, all-honorable Photios. The history of Saint Photios the Great and Patriarch of Constantinople continues on but I am running out of time and I don't wish to burden you any further. Saint Photios is one of the greatest Holy Fathers of the Orthodox Christian Church and Authentic Church of Christ.